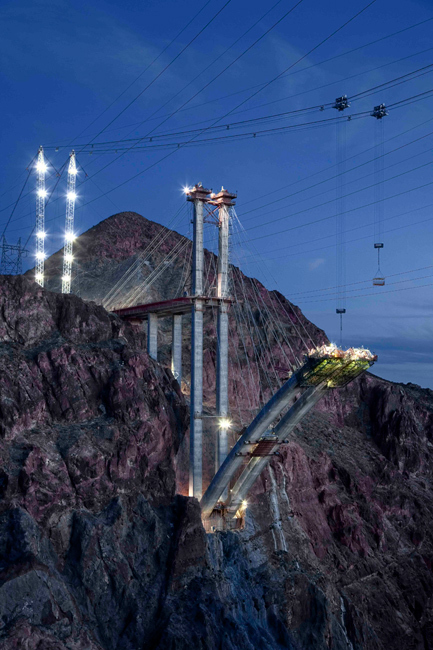 Currently on display at photo-eye Gallery is Jamey Stillings' The Bridge At Hoover Dam. Some of you may recall that we had a smaller exhibition of Jamey Stillings’ work in October of 2009, when Stillings had just embarked on his project. At that time we could tell that his already impressive project would lead to something much larger... and it did. 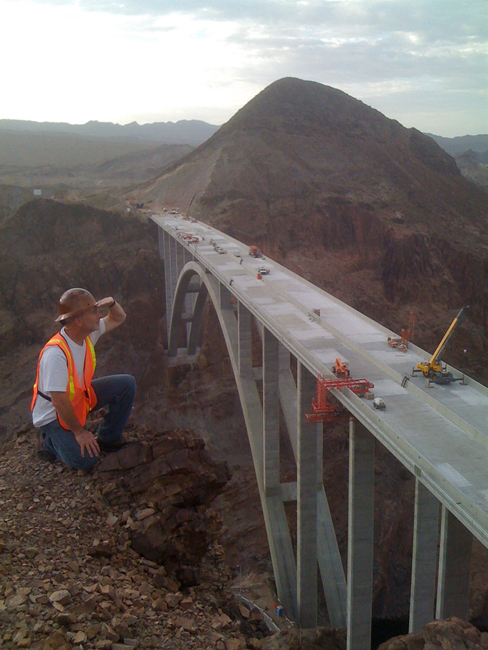 The current exhibition covers the last 30 months of the construction of the new Bridge at Hoover Dam, up to the completion. The work that is currently on display at photo-eye is a selection from a larger traveling exhibit. The next stop is the Phoenix Art Museum. As the project progressed, Stillings was very diligent about sharing his images with us (via digital files). Having had the opportunity to view the stages of construction through Stillings' eyes has been an amazing experience. Stillings' photographs allow the viewer to visually comprehend this major technological achievement. It seems to me that in this day and age, many of us don’t make time to slow down and stop and think, for example, about the bridge that we are driving over — we are simply trying to get from point A to point B. This exhibit opened a few weeks ago and since then I have enjoyed observing people carefully studying the details of each image and making connections between the various stages of construction. Stillings says that when he first encountered the bridge it reawakened a childhood curiosity and awe in him. From what I have seen, viewers experience the same thing. Considering that this work has the power of arousing curiosity in most of the people who have come to photo-eye to see it, I have been asked dozens of questions about the bridge. And assuming that many of us have the same questions, I have asked Stillings to share his experience with us. Anne Kelly: Tell us about when you discovered the bridge — how you felt. Jamey Stillings: Mike Sakas and I went on a photo road trip in early March 2009, as an antidote to an absence of economic activity in my photography business. If we were not going to be paid for making photos, then why not go out on the road for fun to see what we could see? Our decision to cross Hoover Dam was not planned, just a convenient path into Nevada. Why not see the dam again? I had not been there since I was a child. We arrived at dusk and I was first taken by Lake Mead with its beautiful water, dramatic landscape and stark white banding of mineral deposits revealing just how low the water level had descended. My camera came out. Then I turned my attention to Hoover Dam and saw the growing bridge under construction. Until that moment, I had no idea a bridge was being built across the Black Canyon of the Colorado River just below Hoover Dam. I was awestruck. As nighttime construction lights gradually overtook the ambient light of day, the scene became surreal. We immediately made a decision to hang out near the dam for a twenty-four hour cycle. It was during this time that I made the first images from publicly accessible points of view. And with these first few images, a project was born. AK: When did you realize the extent of your project? JS: Before dawn on the edge of a cliff in early July 2009, Bob Nichols with the Federal Highway Administration asked me directly, "Jamey, what's your agenda with this photography?" I knew I was fascinated watching this amazing structure evolve from opposite sides of a dramatic canyon and that I found it photographically compelling. But at that moment, I also realized how this bridge was documented might impact both how those building the bridge and history might remember it. On that morning, I accepted the photographic challenges of the project on multiple levels. AK: How did you acquire the permits? JS: With a letter of assignment from The New York Times Magazine, I returned in April and May 2009 for a total of six days. As with any assignment, I learned the proper contacts and the required policies and procedures. If you want access, you have to play by the rules. 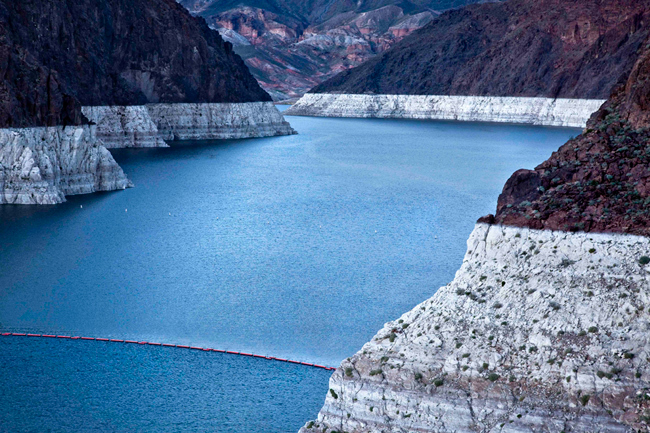 In this case, most of my ground-based access came through formal photography permits with the Bureau of Reclamation. Along the bridge construction alignment, I gradually gained limited access for the editorial essay throughout the Federal Highway Administration. Early on, I introduced myself to the Hoover Dam chief of police. I wanted them to know what I was doing and where I was at all times. Even when I flew over the canyon in a helicopter, I gave the heads up to the Hoover Dam Police and our tail number. AK: How many separate permits have you had to acquire over the past 30 months? JS: Each new trip required new permitting. I think the total is sixteen trips to the bridge and 39 days/nights of photography over a two year period. AK: You did a great job exposing your project. Any advice for other photographers? JS: This project has been about the bridge first. When the subject matter is truly the main focus and not the photographer, it is easy to promote it. I have asked for advice and insight from hundreds of people along the way. Photographic reviews such as Review Santa Fe, FotoFest, PhotoLucida and the Palm Springs Photo Festival have been extremely effective ways to get the work in front of receptive eyes. I entered competitions to put the work in front of specific jurors as a primary goal. We created a website dedicated to the project early on and have built awareness of the project gradually, but continually. It is incredibly rewarding and humbling to encounter such positive responses to the work. AK: What is next for you? JS: I am working hard on the fine art book with Nazraeli Press and am loving the process. This opportunity came through while sharing the work at a review. 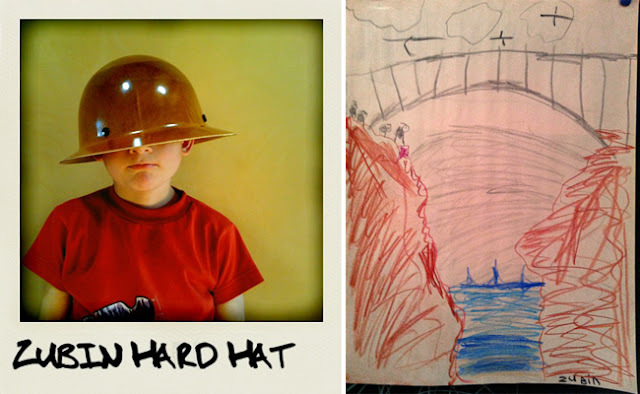 We are looking for exhibition venues to travel The Bridge at Hoover Dam after its first museum show at the Phoenix Art Museum later this year. It takes a lot of energy, time and commitment to "finish" a project. I am also exploring new subjects. Some relate to the development of infrastructure within the landscape. Others will connect more directly with my documentary and portrait background. It is important to be open to new discoveries. I have no idea what the next "bridge" will be in my work. AK: Anything you would like to add? JS: The support of Rixon Reed and the entire photo-eye staff since July 2009 has been amazing and I thank each and every one of you for your help, guidance, experience and insight. Your belief in me has been an important part of the process during the past two years. 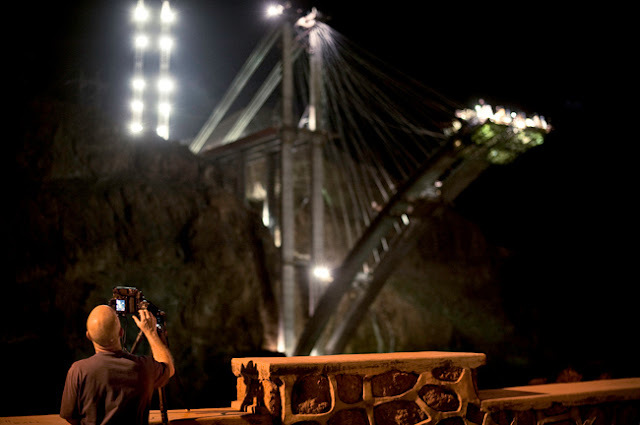 Photographs from Jamey Stillings The Bridge At Hoover Dam can be viewed here. The Bridge At Hoover Dam exhibit at photo-eye Gallery runs through May 21st and will be on display at the Phoenix Art Museum from August 13- December 4th 2011. For more information about this exhibit you can reach me by phone at 505-988-5152 x121 or by email at anne@photoeye.com. 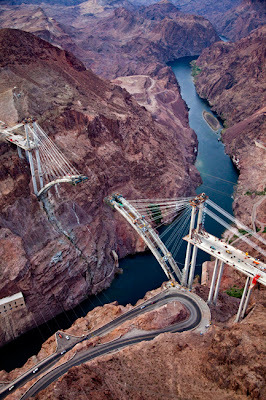 Published in 2011 by Nazraeli Press, The Bridge At Hoover Dam can be purchased here. Signed copies are available.